A native of Chicago and a graduate of the University of Missouri, Eric Bernsee has enjoyed residing in Greencastle for more than 25 years. Years of consuming McDonald's iced teas, Dairy Castle flurries and Marvin's GCBs have helped make him the man he is today. On Sunday afternoon, Chicago Cub legend Ron Santo will be inducted into baseball's Hall of Fame at Cooperstown, N.Y.
Cub fans everywhere should be clicking their heels that the Hall finally opened its door for one of the greatest third basemen of all time. Underscore "should be." 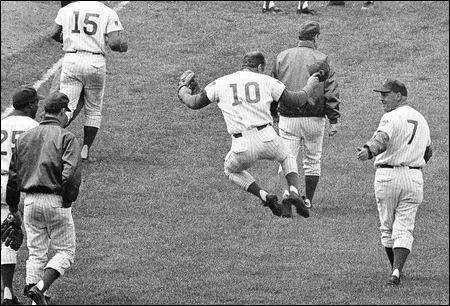 For Ron Santo should have been in the Hall of Fame long ago. That he and his family and his fans had to wait until the ravages of disease finally claimed his bleed-Cubbie-blue body, is nothing short of a travesty. Members of the Baseball Writers of America who left him dangling third in the voting behind the inducted Don Sutton and Tony Perez in 1998 should be ashamed of themselves for denying entry to a Cub legend who amassed 342 career home runs, five Gold Gloves and nine All-Star appearances. The Veterans Committee that went several years without voting anyone into their exclusive little Hall of Fame club, let alone Ron Santo, should have their Hall of Fame credentials revoked. It took a new 16-member Golden Era Committee to vote Santo in with 15 of 16 votes on Dec. 5, 2011 --- a year and two days after he died at age 70 of complications from bladder cancer and diabetes. Santo had concealed the latter disease throughout much of his playing career but it ultimately took both his legs as he continued in baseball as a beloved WGN radio voice. OK, I agree, there been better third basemen. Most certainly Mike Schmidt, George Brett, Eddie Mathews and old-timers like Pie Traynor always come to mind. But I would argue that putting Brooks Robinson, the poster child for modern-day third basemen, ahead of Santo is no given. Santo actually had better career offensive numbers and similar fielding credentials. Yet Robinson was a Hall of Fame lock, and Santo was left hanging 'til after he died. Pitiful. Robinson just had the good fortunate of playing his best baseball and making some outstanding plays in the spotlight of the World Series and national TV in the late 1960s and early '70s. Santo never had the luxury of such exposure. His Cub career came at a time when WGN televised more than 150 games a season, but only into the Chicago market. His highlight reel came before WGN reached superstation and cable channel status. Need a point of reference there? Look no further than Ryne Sandberg, a great player for sure and worthy of his Hall of Fame spot. But Sandberg cemented his HOF resume that July 1984 day he twice homered off relief ace and future Hall of Famer Bruce Sutter on NBC's most memorable Game of the Week telecast ever. In June 1969, I was lucky enough to be sitting in the cheap seats -- the lower grandstands priced at $1.25 a seat back in the day -- when Santo did his initial heel-clicking maneuver. It came after the Cubs had turned a 6-3 Montreal lead into a 7-6 win on Jim Hickman's walk-off homer that floated high and long into the first row of seats beyond the Wrigley Field basket in left field. Overcome with the emotion of victory, Santo pounded Hickman as he crossed the plate, and then ran right past us down the left field line to the clubhouse, jumping in the air and clicking his heels three times in the process. Could there be any more heart-wrenching irony than as Santo waited on that Hall of Fame call that never came while he was alive, diabetes would strip him of those same heel-clicking legs. It was as if it were telling him there would be no further celebrating. But no disease can take that heel-clicking image of my youth from me or any other Cub fans who saw Ron Santo live and breath baseball and the spirit of the Cubs and their fans. His widow, Vicki Santo, will give the induction speech Sunday on Ronnie's behalf. I'm sure she will be kind and politically correct and thank the powers-that-be for Ronnie's long-awaited spot in Cooperstown. But in my heart I wish she'd give them one socially unacceptable finger motion and leave the podium clicking her heels as she went. That would be a Hall of Fame moment.